From Pink Floyd-themed rooms to popular character sculptures, Ryan Johnson has been crafting larger-than-life pieces for high-profile clients all of his young career. The 26-year-old alum from Colonie, N.Y., has already made a name for himself in a niche field as a production artist for LifeFormations Creative Group, a Cincinnati company that produces sculptures, animatronics and environments for theme parks and museums around the world. With a client list that includes Disney, Sony Pictures and more, the company is one of the country’s few to offer artists the opportunity to create hyper-realistic figures of some of the most beloved characters of all time. Johnson, who graduated with a BFA in 3D Studies and a BSEd in Art Education from YSU, is one of those artists. 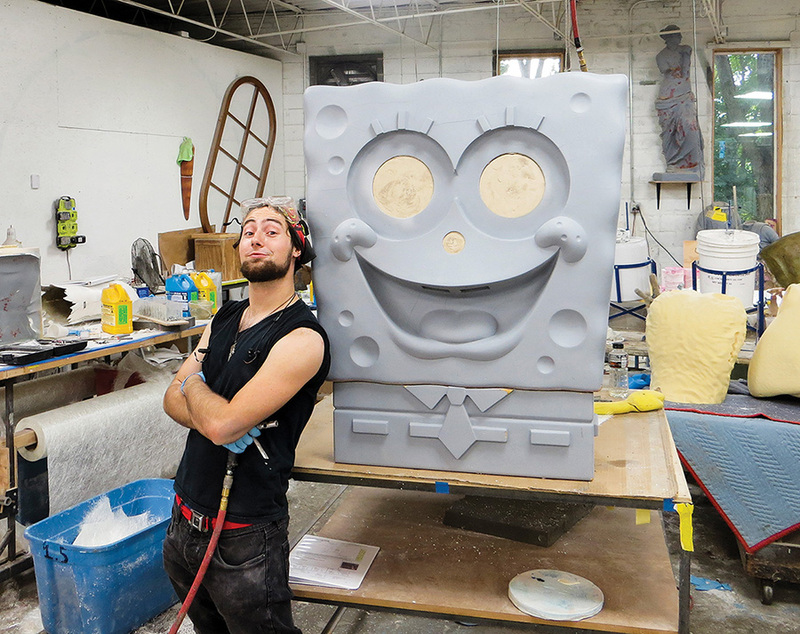 Working in a sculpture shop with a team of others artists, he’s responsible for taking 3D-printed prototypes and hand-crafting them into characters and environments to be installed in different attractions. His main job is to sculpt and paint the figures before and after they’re cast in plastic and structurally reinforced, but he’s also had a hand in welding and mold-making work. With inspiration from his high school art teachers and ties to the Mahoning Valley – the New York native’s mother, Shirley, is a Penguin alum and originally from Warren – Johnson enrolled in YSU’s Art Education program in 2008. But after taking a sculpture class his sophomore year, he fell in love with three-dimensional artwork and decided to double major. Possibly the most interesting of these requests came during Johnson’s senior year. Two clients were in the market for artists to transform a building they owned into a themed showcase for their classic rock memorabilia. “Let’s just call them ‘super fans,’” Johnson said, smiling. He was their first hire and spent two years creating scenes themed around music legends like Pink Floyd and Elton John. One of his rooms even got the rock-on stamp of approval from its muse – the clients showed his finished sanctuary to members of the band Kansas. Best of all, the work Johnson produced in that first freelance assignment gave him the perfect prerequisite experience needed to land his current position. While he’s already immortalized rock stars and cartoons alike, Johnson is aiming for even more; one of his chief after-hours pursuits is developing his own toy line. “I’m teaching myself digital techniques, and I invested in my own 3D printer,” said Johnson, whose apartment has become a makeshift digital and sculpting shop all his own. “I’ve learned every step of the process, from concept art to modeling to mold-making and casting.